Have you ever seen your dog do a back flip? Well, step back because with this easy dog treat recipe, you're about to see a whole new side of your dog. Don't know if your dog likes liver? Try this experiment: Walk around your house with a piece of dehydrated liver in your pocket, and see if your shadow has four legs! This easy dog treat recipe has only one ingredient, beef liver. Liver may not be the prettiest dog treat you can make, but trust me, your dog will not care. In fact, I bet your dog will start asking for it by name. Have you been meaning to teach your dog a new trick or better basic manners? This easy dog treat recipe makes a wonderful dog training treat. Before making this easy dog treat recipe, or any other with liver, be sure to review our tips on purchasing and using liver. Space pieces of liver on sheet pan so they are not touching (see note below regarding Spacing). Bake for 2 hours, rotating the pan after one hour. Lift the parchment paper off the sheet pan and place on the wire rack to allow the liver training treats to cool completely and dry out on the bottom. 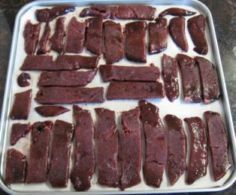 Storing & Yield - These liver dog treats will last for two weeks in the refrigerator. You can freeze them for four months. For more information on storing homemade dog treats, be sure to review our tips and techniques. The yield really depends on how small you make each training treat. It also depends on how often you have a training session. Just keep in mind that since liver has a unique smell for your dog, a small piece will pack a rewarding flavor punch. Cutting Liver - Cutting liver can get tricky as it is very soft. To make things easier, especially since this is an easy dog treat recipe, freeze the package of liver. Then let it thaw for a few minutes on the counter. Sharpen your knife and cut the liver into strips while it is still frozen. It will continue to thaw while you handle it and before it goes into the oven. Spacing - Even though the liver will shrink, it spreads out a little before it gets thinner. So the more space you can allow between each piece the better. Actually this is one time that the picture above is a good example of what not to do. Although the treats came out great, I had to tear them apart. If possible, leave about a 1/4 inch between each piece. Parchment Paper - It's not necessary, but it makes things easier after baking, if you cut the paper to fit your sheet pan. Then the paper will not be curling and getting in the way of the liver. Oven Temperature - This recipe is a great time to use an oven thermometer. You can easily check for the accurate temperature and adjust accordingly. 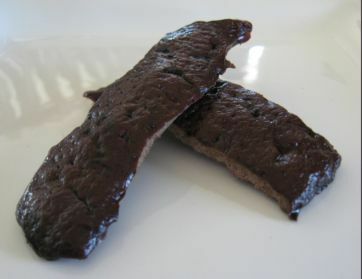 Texture - You are looking for a jerky or flexible texture with these liver treats. They will be slightly spongy in the center, but with a firm outside. Cooling - It's important to let the dog training treats cool off of the sheet pan. The liver will be slightly moist underneath, and it needs the opportunity to dry out. Of all the dog training supplies you may need to purchase, this is by far the most exciting for your dog. Who knows, maybe you'll need less methods to prompt your dog to perform tricks and mind his manners, with this easy dog treat recipe. Shipping Treats to Relatives Hi I enjoy baking for my two dogs here at home. I also would like to share these treats with my brothers dog that lives in another state. Copyright © 2008-2012 DogTreatKitchen.com. All rights reserved.